Epic THAI MEATBALLS!!! 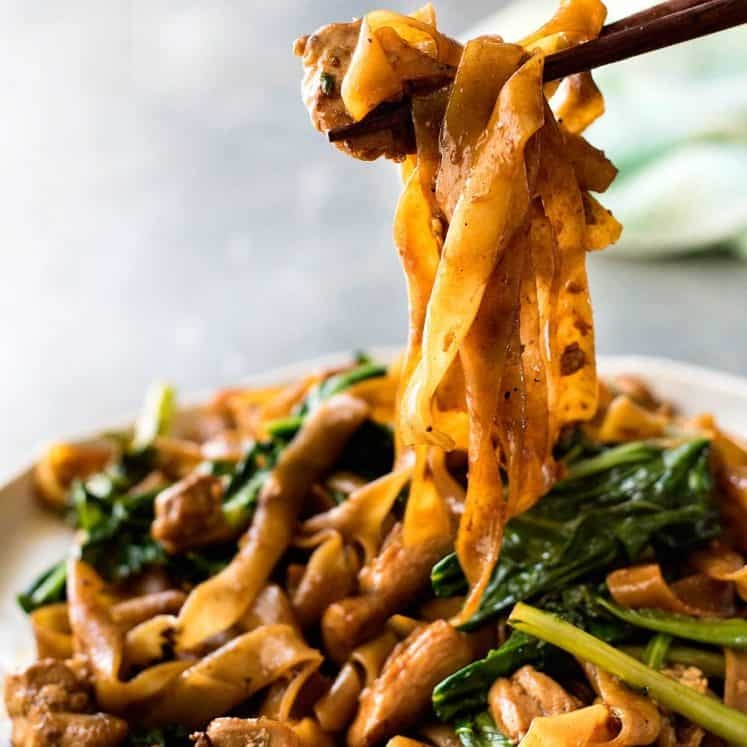 Made with pork or chicken, the brilliant Thai flavour of these will have everyone convinced you picked them up from one of those posh Thai restaurants. Served with a Sweet Chilli Dipping Sauce, these are seriously tasty!! If you’re in the mood for a Thai Banquet, try these Thai Meatballs with a side of Chicken Satay and Thai Fried Rice! You can mix together mince with coriander/cilantro, garlic and a dash of soy and get away with calling that Thai. And they will be ok(ish). 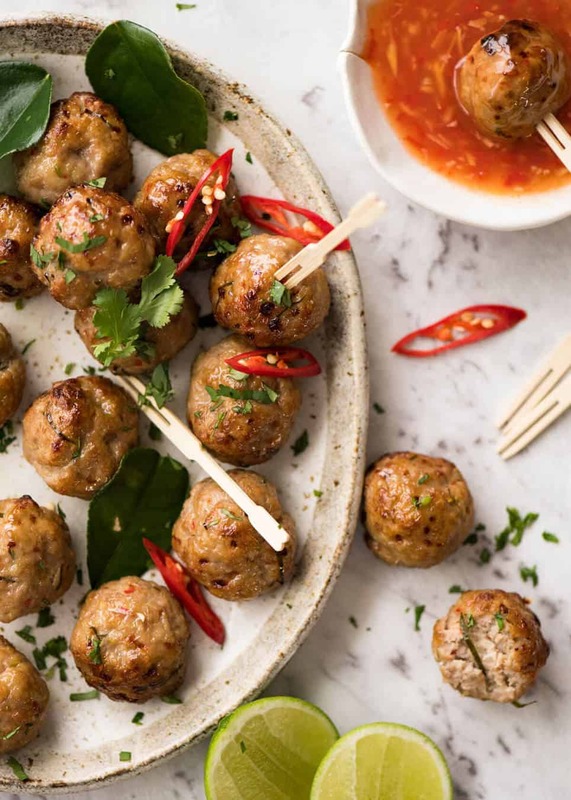 But if you want some Thai Meatballs that are seriously delicious, and really truly do taste real-deal Thai, then you’re going to need the help of a few more things. I think you’ll be familiar with most of the ingredients in these meatballs, except perhaps this one – Kaffir Lime Leaves. 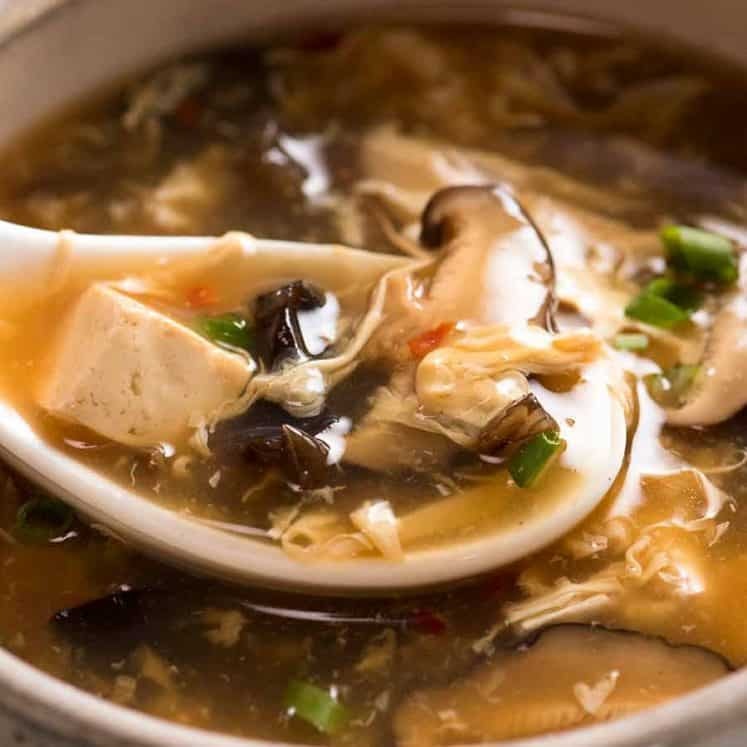 Now, before you run around town trying to hunt these down in an Asian store, let me just stress this fact: yes it adds a little something-something that is so authentically posh-Thai-restauranty, but it isn’t mandatory!! Kaffir lime leaves aren’t from normal lime trees, they are different. They smell limey but more earthy. They are plonked in whole into curries / soups / coconut rice to infuse with flavour, or finely chopped as pictured above. Cut out the stem, roll it up like a cigar, then finely slice (cause they are kind of tough, got to chop ’em finely). They cost a few dollars for 20 or so, and they freeze so well! I use them in a handful of recipes and I’ve linked them in the notes for you. Just give them mix and you have yourself some seriously tasty meatballs. 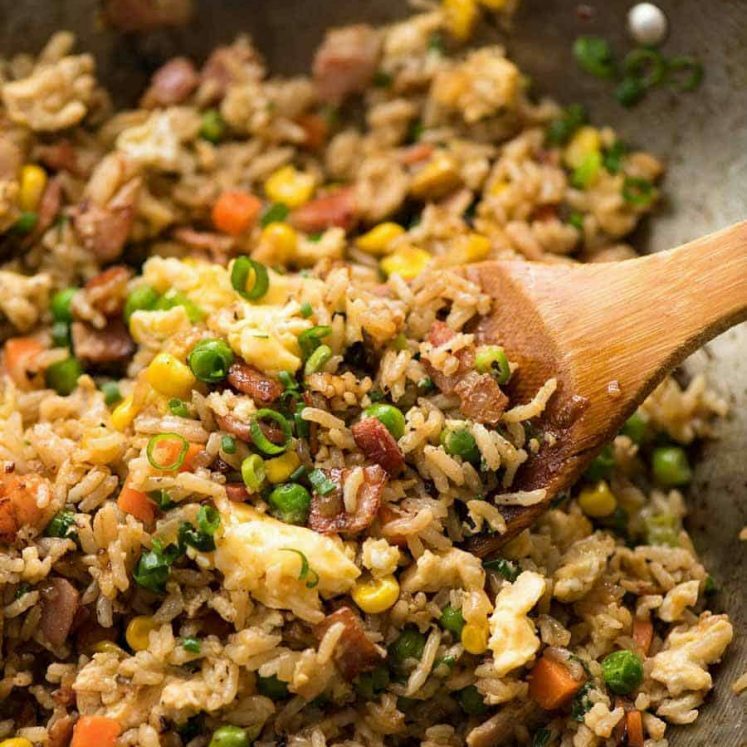 How to cook them – because they’re so lovely and soft, they are kind of hard to pan fry. So I bake these. They hold their shape and are golden on the outside, and juicy on the inside! I totally cheat with the dipping sauce. I just doctor up sweet chilli sauce with some garlic and lime juice. Make a meal out of it – serve these on the side! 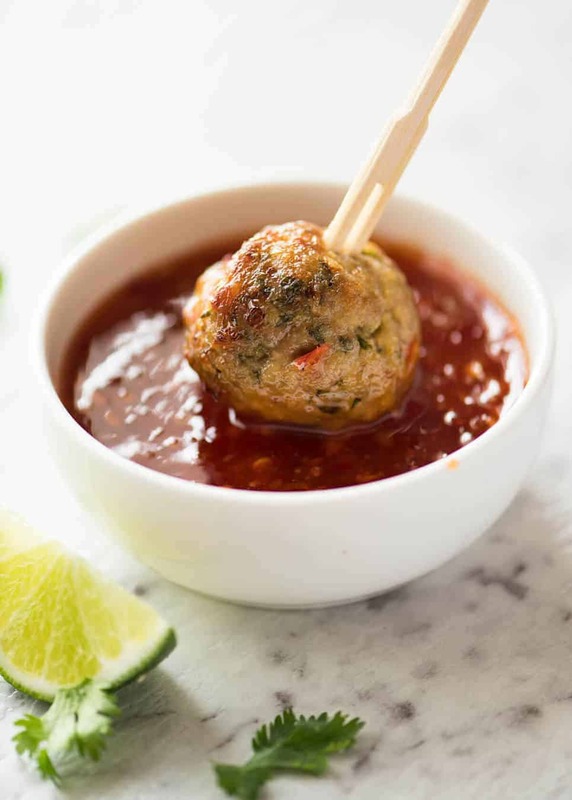 The beautiful, fresh Thai flavour in these meatballs are amazing! Truly like something you'd get at those posh Thai restaurants. These aren't authentic Thai, as far as I know there really aren't meatballs in Thai cuisine (at least, not like this, they have them in soups), but all the flavourings in this are real-deal-Thai. Recipe VIDEO below. Preheat oven to 220C/430F (standard) or 200C/390F (fan / convection). Place a rack on a tray (optional, rack keeps balls slightly rounder). Spray rack well with oil and place the meatballs on the rack. Spray meatballs generously with oil, then bake for 20 - 25 minutes or until a bit browned. They should be beautifully soft - see video! Serve warm with Sauce, garnished with coriander and chillies if desired. Place ingredients in a bowl and mix. Set aside for at least 10 minutes before using. 1. LEMONGRASS: I use paste in the video, so you can see what it looks like. Lemongrass paste is sold in the fresh herbs section (fridge) at supermarkets in Australia. They are a terrific easy substitute for fresh, and it's perfectly acceptable! A Malaysian friend of mine also told me that "everyone" in her family uses frozen finely chopped lemongrass which you can buy from Asian stores, this would also work great. To use fresh, peel off the green outer reedy part, then finely chop the soft white part. You'll need 1 very large or 2 normal lemongrass sticks for this. 2. Kaffir lime leaves: this is an optional extra that will really give these meatballs an edge that is like what you get from really great Thai restaurants. 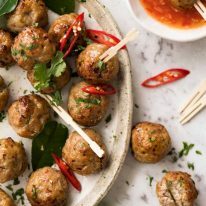 But even without, these meatballs are a cut above the usual Thai meatball recipes, so don't fret if you can't find them! They are not the leaves of normal lime trees, they are different trees. Used in many south easy Asian cuisines, they are limey but have an earthy flavour. In Australia, you'll find them in Woolies, Coles, Harris Farms, fruit & veg stores (herb section) and of course, Asian stores. THEY FREEZE GREAT and last for months and months. Then use for: Coconut rice, Beef Rendang, Mango Red Curry. Finely slice and add to South East Asian salads and stir fries, use whole in soups and curries. It's a secret ingredient that will make people stop and ask "tell me your secret!!" DRIED KAFFIR LIME LEAVES can be substituted, but because they are not as aromatic as fresh, add the zest of 1 fresh lime as well. 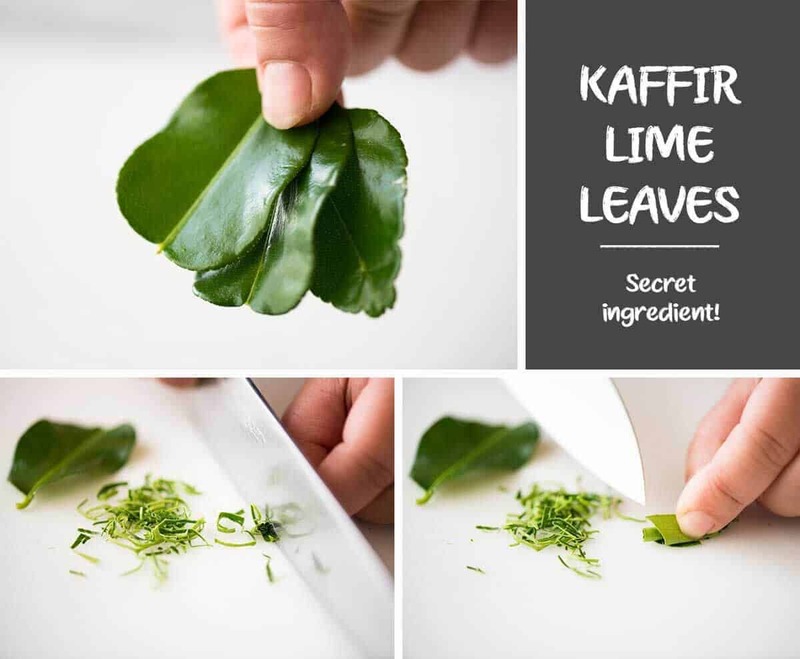 Use 1 tsp of finely crushed dried kaffir lime leaves (use your hands or finely chop). 3. Chillies: 3 Thai or birds eye chillies makes it moderately spicy, not blow-your-head-off. 🙂 Thai all the way! Dial it down by using only 1 if you are concerned. Or, use large red chillies (like cayenne) which are not as spicy (smaller chilli = spicier), and use 1/2 of one, that way you'll get the little red bits in the meatballs without the heat. Or skip it if you really want, it won't change the flavour, just means they won't be spicy. 4. Coriander / cilantro: Watch the video: bundle up the leafy end tightly then finely chop. Use the stem as well as the leaves, great flavour in the stem! 125ml/1/2 cup water, 2.5 tbsp sugar (any), 3 tbsp rice wine vinegar, 1 long red chilli and 1 birds eye chilli (finely chopped,seeds reserved), 1 cm 2/5" ginger (julienned), 2 cloves garlic finely chopped, dash of fish sauce, 1 tsp sriracha, 1.5 tsp corn starch dissolved in 2 tsp water. Bring sugar and water to boil in small saucepan over medium heat. Add vinegar, chillies, ginger and garlic. Simmer, stirring occasionally until sugar is dissolved and liquid is reduced by a quarter. Add the fish sauce and stir in the chilli sauce. Drizzle in the corn starch slurry while continuously stirring over heat, until mixture thickens into thin syrup. Remove and allow to cool to room temperature, will thicken as it cools. 6. Rolling Meatballs: Here's how I roll meatballs in a bid to be speedy - measure and dollop all the mixture using a cookie scoop (I use a 1 tbsp one) onto a work surface. THEN roll them. Rather than doing them one by one. I promise this is faster! 7. Make ahead: Freeze raw on a tray then to save space, transfer into bags / containers. Thaw then bake per recipe. They also reheat great in the microwave! 8. Side suggestions for a meal: Thai Fried Rice (skip the meat) + slices of tomato and cucumber (very Thai), Asian Noodle Salad, use the dressing from this Thai Beef Salad to make a giant Asian leafy salad. 9. Nutrition per serving, assuming this serves 4 as a meal. Be warned of close encounter with Baby Hands. Also – Dozer fans – don’t miss his little cameo at the end of the recipe video. I swear, one day a pelican is going to turn around and give him a big peck!! 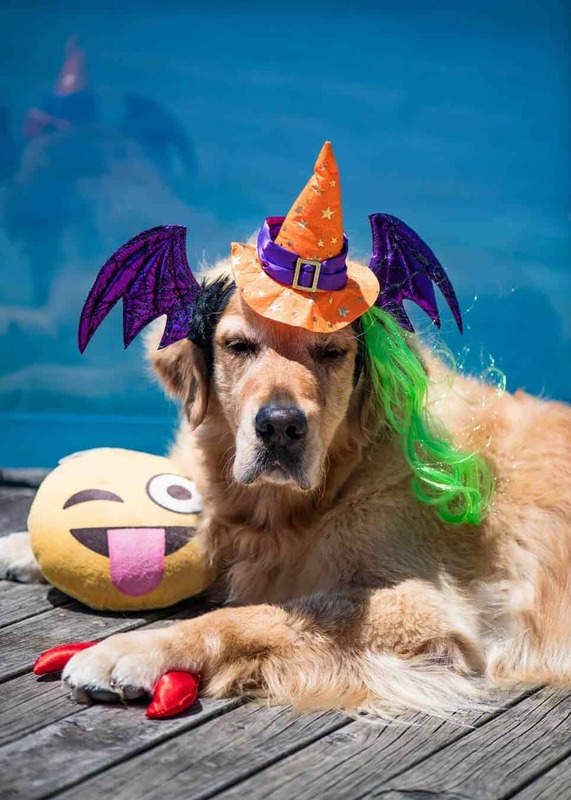 He’s really looking forward to tomorrow (Halloween). Hi Nagi, thank you for sharing your amazing recipies. 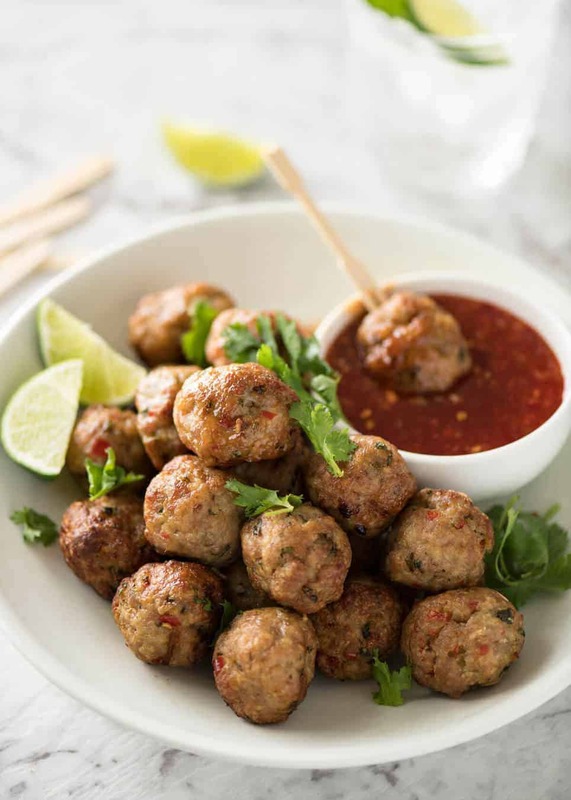 Can the flour in the thai meatballs be substituted for almond or cocosflour? 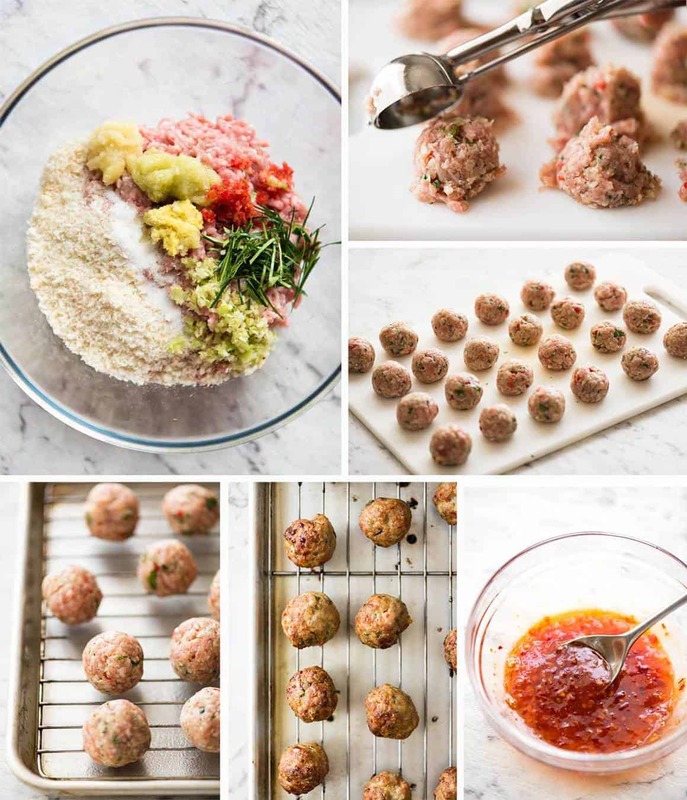 These meatballs are easy to make and delicious! I added them to my usual green curry with lots of veggies. My huband thought I was crazy to take it to a church lunch but the empty pot said differently…. Love the dog and the recipe for meatballs. I did add double amount of fish sauce and also 2 chopped scallions, otherwise great! Thanks. Awesome Rick! Thanks for the feedback! Made this recipe for friends visiting over the weekend. They loved the meatballs and they were so tasty and easy to make. I made them with chicken mince and added more breadcrumbs which made them easier to roll when mince is moist. Hadn’t used panko breadcrumbs before but found them very good. Will definitely make this recipe again. Thanks Nagi! OMG! Let me shout to the world how wonderful these are! I’m having a BYOB (bring your own balls) gathering so I’m trying out recipes. No need to look further. I think the host will the winner. I have a convection oven so used that and they browned beautifully. And were so soft. Cant’t wait to try more of your recipes. Love your Dozzer. All I can think of now is “Bring your own balls”!!!!! HILARIOUS!!!! !